If you've been alive at any point in the last several months, then you've likely heard these phrases ad nauseum. "The Dow is down." "It's time to downsize." "Americans are hunkering down." Down. Down. Down. Ugh. How about a little cheering up, up, up? Apparently there's a sweet lining in all this gloom and doom: candy. That's right. According to a recent NY Times article by Christine Haughney, as US unemployment has risen so too has Americans' candy consumption. Not just any candy though; the old-fashioned, make--you-feel-like-a-kid-again candy such as Tootsie Rolls, Bit-O-Honey, and Mary Janes. Why candy? Maybe because the sugar high is soothing. Maybe because it instantly brings to you back to your childhood, which was blissfully free of adjustable rate mortgages and shrinking 401Ks. Maybe because Costco sells 10 pound buckets of the stuff for about $5. Whatever our individual reasons, we're definitely eating more candy. From mom and pop candy shops to candy giants like Hershey's, profits have been sweet. 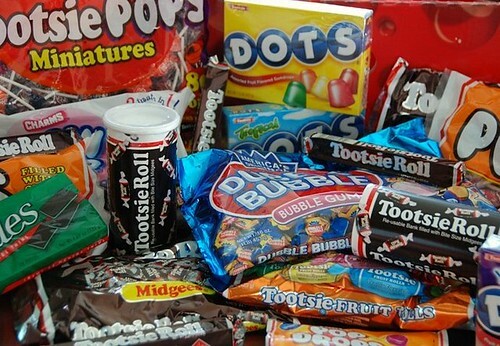 So you can imagine how happy I was when I received a box of candy from Tootsie Roll Industries that contained many of my childhood favorites such as DOTS, Blow Pops, and, yes, Tootsie Rolls. It was a blast from the past. The first candy I ate was a black licorice Crow. As soon as my teeth sunk into the sticky, gooey drop, I was instantaneously transported to a 1982 movie theater watching E.T. Then I went around the house all week giddily blowing monster-size pink bubbles with the Dubble Bubble gum, much to Jeff's chagrin. He also found Andes Candies mints on his bed pillow and Tootsie Rolls in his lunch bag. It was a good week. Today I'm excited to say that you too have an opportunity to taste some Tootsie Roll nostalgia! That's because Tootsie Roll Industries is a hosting a give away on Food Blogga. Click here for the details, then leave your comment below. Since two people can only eat so many Tootsie Roll midgees (yup, that's what they're called), I decided to get creative and make some Tootsie roll fudge. Yes, it is as good as it sounds. I adapted my mom's amazing peanut butter fudge recipe; it's made with melted Tootsie Rolls, crushed gingersnaps, and ground pecans. It may not stop your stocks from falling, but it sure will make you fret a little less. Coat a 9-inch square cake pan with cooking spray. In a medium saucepan over medium-low heat, add sweetened condensed milk, butter, and Tootsie Rolls. Stir continuously until butter and candy are completely melted and mixture is thick and smooth. Remove from heat. Add crushed ginger snaps, vanilla extract, and pecans. Using a rubber spatula, mix until well blended. Pour fudge into the prepared pan. Cover with aluminum foil and refrigerate until firm, at least 4 hours, or preferably overnight. Slice into 7 equal rows to create 49 square pieces. It's a good idea to use a ruler to ensure equal size pieces. Fudge can be made up to a week in advance and refrigerated. 4 sweet recipes featuring favorite childhood candies on my NPR article, "Grown-Up Tricks For Treats." Why Tootsies? Is there any other candy? I love tootsies...especially the pops and the fat rolls that come in the variety pack. When I stock my office with candy, the kids always ask about tootsies and I tell the to only worry about what they see in the jar...(I am think they don't need to worry about the tootsies I stashed in my desk drawer. I love Tootsie Rolls....I can remember going on a vacation in the wilderness of Canada and taking huge bags of Tootsie Rolls. One day it was so cold that we needed something to warm us up...so I made hot chocolate from Tootsie Rolls. That is one of the best hot chocolates that I have ever had. I'm certainly a tootsie roll lover. give me the chocolate, fruit or whatever - I love them all! :) I'd love to win this b/c I spend all day at work trying to find candy to satisfy my sweet tooth. This way i can pay back all the people I steal candy from, hehe. I would LOVE to win all these Tootsie Roll Goodies, because.. MY favorite Goodie is a Tootsie roll Grape Lollipop, I just go crazy for them! But, I have an 18 year old daughter that runs 12 miles a day and she and her friends would go crazy for all these goodies, they run their calories off and this would be such a delight for them! I just want ONE GRAPE Tootsie POP! YUM! Wow--that fudge looks great! Fabulous combo of flavors. And why would I love to win? It's a blast from my past, too--but I've also never even HEARD of DOTS or Blow Pops (maybe not in Canada??). Cool! Did you get any of their Flavor-Rolls? The fruit-flavored Tootsie Rolls? They are my absolute favorite... and I'm wondering, since I don't usually eat the vanilla ones in the pack, could they be an equal substitute in your fudge? What a creative idea - love it! I love tootsie rolls. I love how you can make them last for a long, long time. I also love this fudge of yours! I would love to win such a fantastic box of treats! Mainly because I'm still not sure how many licks it takes to get to the center of a Tootsie Pop. 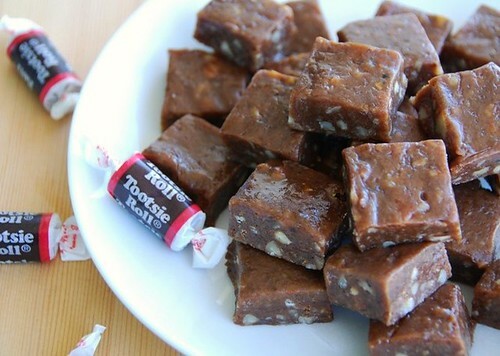 Tootsie Roll fudge is a great idea! My favorites were the flavor rolls and the tootsie roll pops. I have wonderful memories of watching the commercials with the owl as a child. I'd love to win the contest so that I could bring a little joy to the lives of my friends and peers by sharing candy during the upcoming exams. Thanks for hosting the contest. Gorgeous looking fudge! A reat temptation! I have been living in Europe for about 22 years. Every time I get back home to the US, only about every two years, I load up my suitcase with the candy favorites I grew up with - yes, Mary Janes, Bit-O-Honey, Candy Kisses, Red Licorice Whips, Jolly Ranchers, and most of all, Tootsie Rolls and Tootsie Pops. I can't get enough of Tootsie Rolls (ah, yes, midgies) and Tootsie Pops. Call it Nostalgia, but there it is. They do so bring me back to those simpler, happier childhood times. But having a "candy drawer" filled with my childhood faves here in France is soothing, comforting and so necessary to get me through my expat life! Husband and kids think I am out of my mind, but there you have it. I think this is the coolest ever give-away! Thanks! Tootsie roll fudge?! Amazing!! I'm going to have to try this and hand bags of it out at halloween this year! I love Tootsie Rolls, and would really like to win some! I remember eating Tootsie Rolls as a child. They were a big Halloween favorite. I used to save my milk money (sorry, Mom) to buy candy at a little store that was on my way home from school, and a big Tootsie Roll was 1 item I bought often. As a kid, i once shoved a tootsie roll up my nose (to my mom's horror). It took her quite a while to get the melting mess out using tweezers! Gotta love tootsie rolls!! I love Tootsie Rolls. They have so little sugar that even with diabetes I can eat a few and not feel guilty about it. I love all tootsie products, but my favorite is the tootsie roll pop! I'm surprised my teeth didn't rot as a kid with all the Tootsie candy I ate. Love Tootsie Pops and the Tootsie Rolls, but I really really love the fruity Tootsie Rolls. Wish I could find them year round, but only seem to find them at Halloween. Why would I love to win? My husband loves Tootsies, and I love Dots. Easy enough, I guess. I'm confused about the recipe, though. Is it 2 cups of Tootsies, or 4? Because a chocolate candy is the perfect candy. I have never had Tootsies, but I would never say no to fudge. Funny how many of our memories are connected to candies... Susan, Tootsies are not part of my childhood tastes but fudge does sound good! Oh my gosh all that candy looks amazing. I would love to sink my teeth into a Tootsie Roll..my absolute favorite. I have not had one for years...although I have to admit when you mentioned the licorice crows I could actually taste them! My mouth was watering just remembering how yummy they are. Hubby is standing behind me yelling; "Dots! Dots" ..silly man, its Tootsie Rolls! Oh, I love tootsie rolls! I totally agree that they are nostalgic and remind me of my childhood. Plus..Dots? Well, I could eat like 5 lbs of them in one sitting, sticky goo on my teeth be damned. This fudge looks great, Susan! Your fudge looks lovely! I haven't heard of any of that candy, but apparently the same think is happening here in the UK too! Susan, I must say that's one creative recipe! Love your post. Tootsie Roll Pops were one of my favorite kid candies. OK, is it 48 midgees TWICE, for a grand total of 96? Or is it a mistake that that ingredient is listed twice? I love the lime tootsie rolls (really any lime candy...) and tootsie pops. My boyfriend loves candy and would be thrilled to receive this box of goodies! Are the tootsie rolls listed twice in the recipe for a reason? TR's have been a favorite here for a long time. There is a store not too far away that has an amazing selection of candy from childhood. A food trip down memory lane is always a treat. Oh, love Tootsie Rolls and the fudge recipe! I want!!! OMG i love tootsie roll midgees! this recipe sounds delicious!!!!! i cant wait to try it! First of all congratulations for publishing your cookbook. Shall be looking forward to it. Your fudge sounds irresistible. And the fudge makes me teeth hurt - but in a good way. Pass them on over, please! anonymous-It's 48 midgees, total. Thanks! I love Tootsie Rolls! And Dots. And all chewy candies, chocolaty candies, etc. I guess it makes sense... I do eat more candy when I'm stressed and it does make you feel better! I love all those oldies but goodies too. I had them all since I lived 2 houses down from a penny candy store in my neighborhood when I was a kid. My sister and I would go everyday after school and fill up on all that wonderful sugar!!!! What a fun recipe! 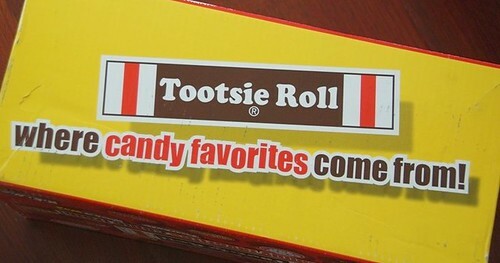 I used to love tootsie rolls- I havent had them in ages but they were one of my favorites growing up! I'd like to win so that I could share the tootsie rolls with my Dad! He loves this candy and I love him! Tootsie-Pops are my favorite. I pop one in my mouth and let it dissolve while I ponder my work on the computer. And finally, I reach the center--that chewy, chocolaty prize. I hope I hope I hope I win! Fudge alone is so delicious, but combine it with a Halloween favorite of mine and it is really tasty! I was getting sick of eating Tootsie after Tootsie so I think a nice fudge is needed. Thanks for this idea, such a great one!